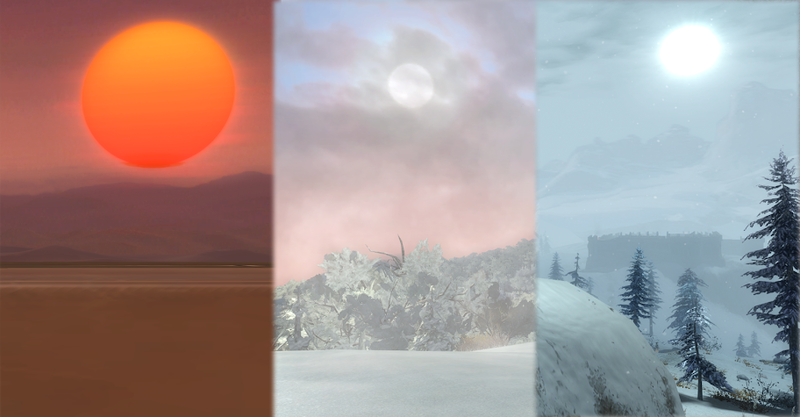 The sun in (from left to right:) SWTOR, LotRO and Guild Wars 2. Today the gaming PC died on me, which left me with no means to play computer games. * At the moment of writing, I cannot take the pictures for the SWTOR outfit designer post I was planning and Conrad is raiding with our progression group, getting to 13% of the boss we've trying to kill for about a month (I'll kill him if they make it tonight!). So here I am, all alone at home, getting a bit bored. I know, right, the harsh life of a gamer without PC. So while I'm letting out a deep sigh, my eye falls upon Rowan's latest post urging me to become all zen. How could I have forgotten? It's Developer Appreciation Week (DAW)! "We forget that those "evil" corporations are mostly just a bunch of people trying to make a living for themselves and their families." This rang especially true for me remembering the demise of Lord of the Rings Online and the emotions that I dealt with regarding the course of that game. I was so involved with it that I felt disappointed, angry and even a bit hurt when it became clear the quality went down beyond the point of being able to play endgame. The recent revelations of former Turbine employee "Aelwyn" really opened my eyes to what had been going on behind the scenes, and that had a big impact on my opinion of the game. For me, understanding the day-to-day reality of the developer team made the largest portion of my negative emotions disappear to the extent that I can enjoy LotRO again. Developers are indeed people, too, and they cannot steer the larger forces that are at work influencing the shape of their game. Thank you, SWTOR developers, for creating and maintaining the high quality game I have come to consider my main MMO these days. I really appreciate the tough challenges the current endgame (and the hardmode raids in particular) provide and the continuous updates and new features that show your dedication to this game. Guild Wars developers, I hereby thank you for creating the game that sheltered me when things in that other MMO started to bleak a little. The feeling of exploration in your game is enthralling, and the efforts you have made to create a fresh approach to leveling and gameplay really show. Dear LotRO developers, I have honestly no idea what you guys are doing these days and I don't envy your position. I'd like to thank you for keeping the servers and game up and running so I can still occasionally immerse myself into the world of Tolkien, exploring the last bits of Rohan with my boyfriend. And finally, to my readers that blog themselves: I challenge you to write your own post in appreciation of the developers that work on your favourite game(s) this week. Okay, that's enough zen for today, I'm going back to cursing at the gaming PC. * Okay, I could technically play Tiny Death Star on my smartphone the whole evening, but I'm going to act elitist for once and say that doesn't count. I'm a bit grumpy, okay? Ugh! I know how you feel about your busted PC. I went for a couple months last year without a reliable rig before managing to cobble together something thanks to an generous friend. And right now, Scooter's computer randomly reboots at odd times. No thanks are needed, though, it's a good initiative. I can't stand all that complaining about games: that's why I generally avoid gaming fora like the plague. I can just hope my occasional critique doesn't translate as a rant to readers. Thanks for your compassion with the PC. I hope the issue is solved faster than "for a couple of months" (the horror)! Dear Rav's busted gaming PC, you were a light in otherwise dark times when boredom threatened to take over. You were a source for entertainment when real life got too hectic and over whelming. You were the home in which her mind was able to wander free. You will be severely missed. You led a group good life, but like most machines, your end has come too soon. You can never be replaced, only expanded upon. May your decent into the after life be a welcoming experience, and may the gods of computing welcome you home. I hope that eulogy for your dead PC isn't too strange. Thanks for introducing me to this initiative. I will be sure to place a post on my blog as well. It should be refreshing to many to see some good points about our favorite games shown in the limelight instead of all the negativity. That was a beautiful eulogy, I think you may have missed your vocation!